A new Deluxe Edition of Out of the Dust will be available on June 9th, featuring 5 additional acoustic tracks. Following the successful March release of their self-titled national debut album (Discovery House Music), husband-and-wife duo Out of the Dust are preparing for a busy summer with an upcoming 30+ city tour and a digital exclusive Deluxe Edition of Out of the Dust available on June 9th, featuring 5 additional acoustic tracks. To help celebrate, NewReleaseToday.com (NRT) kicked off a month of Out of the Dust music video premieres starting on May 12th with the exclusive premiere of "All That I'm Made For.” On May 19, NRT will give music fans a first look at the music video for "You Pursue,” followed by "Your Will” (May 26), "Make Us Whole” (June 2) and "How Deep The Father's Love For Us” (June 9). From coast to coast, Out of the Dust has been resonating with audiences as Chris and Stephanie Teague share their real-life story of downfall, heartbreak, and miraculous redemption that is woven deep into the fabric of their music. The 11 songs on Out of the Dust were birthed from a difficult and raw time in their lives, including a separation, divorce, and remarriage. Their lyrics address not only the pain and reality that life brings, but the hope and healing that Jesus offers. These memorable songs speak to the hearts of listeners as they make sense of their own lives as Chris and Stephanie tell their own story with the hope of encouraging any heart that’s ever been broken. After growing up in church and marrying young, like so many young men, Chris slowly and quietly lost all faith in God during college. Even while slipping deeper into drugs and every other whim of his heart, he secretly managed an alter ego for years around church friends, family, and even Stephanie. Finally, everything surfaced one Thursday night in January 2010 as Stephanie’s life unraveled before her eyes. Their young marriage quickly collapsed in divorce as Chris walked away from God, friends, and everything he had built with Stephanie. What happened next can’t be called anything other than a miracle. His independence very rapidly found him in the darkest and most desperate place of his life, and it was there that he was shown the depth of his selfishness and pride. Incredibly, in just over a year, God mended their hearts, restored their marriage, and still continues to breathe new life into their story today. 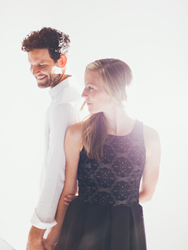 Chris and Stephanie's amazing story carries a message of restoration that is artistically delivered in their music—a mix of indie, folk, and pop styles that is stirring, thoughtful, and uniquely their own. Their influences range from the intricate lyricism and ambience of Fleet Foxes to the fun, quirky melodies of Ingrid Michaelson and the skillful, acoustic arrangements of John Mayer. Out of the Dust is a vulnerable portrait of the brokenness and uncertainty found in the human experience, yet it offers hope and redemption to an aching world. The album features sweeping arrangements of strings and instrumentation from skilled producers Joe Causey (Colony House, Jenny & Tyler) and Kyle Cummings. Out of the Dust will hit the road this summer, heading out over 30 cities from coast to coast on their “Can We Come Over” Summer House Tour in association with Food for the Hungry. They’ve also been added to Family Life’s popular Love Like You Mean It Cruise in early 2018, which is already sold out. May 12 - Nashville, TN - TBN’s "JUCE LIVE” - Airs nationwide - Check local listings!